The deputy mayor of Belgrade, Goran Vesic, the state secretary at the Ministry of Internal Affairs, Miroslav Milickovic, and the president of the municipality of Rakovica, Vladan Kocic, visited the reconstructed part of Pere Velimirovica Street and the part where the street connects to Patrijarha Pavla Blvd on Friday, March 22. A traffic bridge with two lanes in each direction has also been built at this intersection. 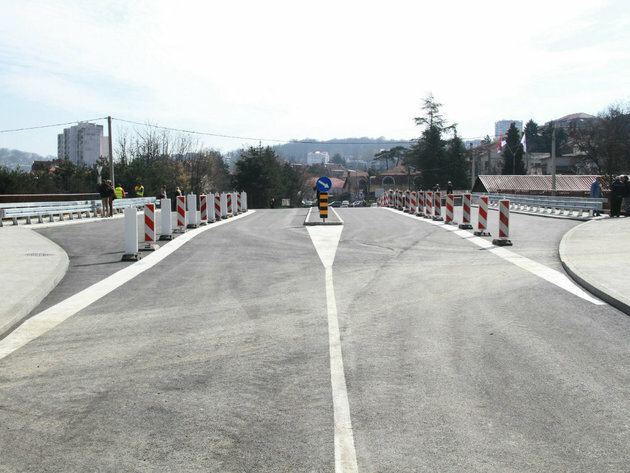 Vesic said that the bridge which connects Pere Velimirovica Street and Patrijarha Pavla Blvd had opened for traffic within the completion of the first phase of the development of access routes through Patrijarha Pavla Blvd, toward the Ada Bridge. – The bridge is located on the new Topciderska river bed. We moved the bed in order to enable the expansion of Patrijarha Pavla Blvd – Vesic said. According to him, the Belgrade Land Development Public Agency has opened a tender for the second phase, nearly 1.9 kilometers long. The next step are another two phases, he added – to connect with the Ada Bridge and the one from Pere Velimirovica Street toward Kapitol Park and Vidikovac. As Vesic explained, the contractor for the second phase, worth RSD 1.3 billion, will be selected in May or June.